Good morning, My name is Made Sentana, I am your Bali Cab Driver for today, as we discuss yesterday via phone, today we will take you on Bali river tubing adventure, Bali offers many adventure activities and one of the outdoor activities which is must try and experience while in Bali is Bali Tubing. In Bali we have 3 river for join the tubing, one of the river which located near Ubud and very popular for Rafting activities is Ayung River, with 11 km Long and rapid 2-3, this river offers most challenges Tubing Adventure, the duration is about 3 hours, on the tubing we will use paddle to control the tube, helmet life jacket is provided and instructor will be with you for your safety. Where is Ayung River Tubing ? Our Tubing Base Camp is Located at Sayan village, near Ubud Center, as we start from Kuta, its take about 1,5 hours drive, we will see how the traffic, once we arrived at the base camp , we will get warm welcome for the local staff and registered while offers us welcome drinks, all you belonging will keep at the locker, if you want bring small camera or mobile for photo during the stop, the guide will keep it at the water proof bag. Then we will transfer to Payangan village, where we will have the start point and all safety equipment will outfit here, to get the river side, we have to walk down pass the field and step about 400 stair and finally we will arrive at the Ayung river side, our guide will give safety talk, please follow our guide instruction for your safety. Then get ready to paddle along the river Paradise, discover the hidden waterfall and cliff carving and see the wild lifes that we can see along the tuning adventure trip. After 3 hours journey, we will arrive at the finish point, then walk up stair back to the base camp. Shower change then enjoy sumptuous Indonesian buffet lunch. Can Child Join on Ayung River Tubing ? Child under 15 years is not allowed join on the Ayung river tubing as the river is wild for tubing adventure, its valid for adult only who are in good shape, recommended for 15-55 years old. What The inclusion on Tubing Trip ? 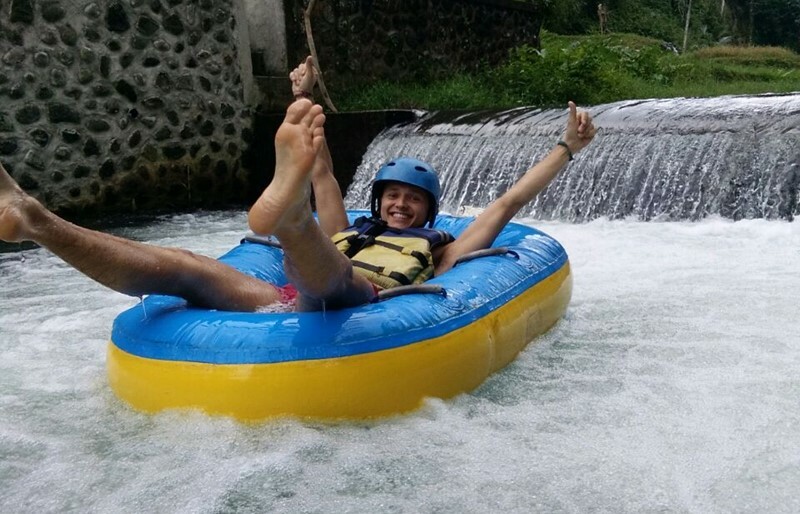 How Much I should for the Ayung River Tubing ? As you take our cab services for minimum use 10 hours for IDR 550,000/cab, for the tubing we can help with best deals IDR 550,000/person. After the tubing trip, we may drive you to Ubud Center to visit the Ubud Palace and Ubud Art market or Ubud Monkey Forest, or we may drive up to north of Ubud to see the rice terraces of Tegalalang or drive to Heritage Temple of Elephant Cave Temple (Goa Gajah Temple). Or if you love art galleries, we may drive to Mas Village to see the wood carver or Ubud down town village to see the painter community or Celuk Village for silver smith works. Other option we may see the Waterfall of Tegenungan. Where we can take the child for the Tubing trip? 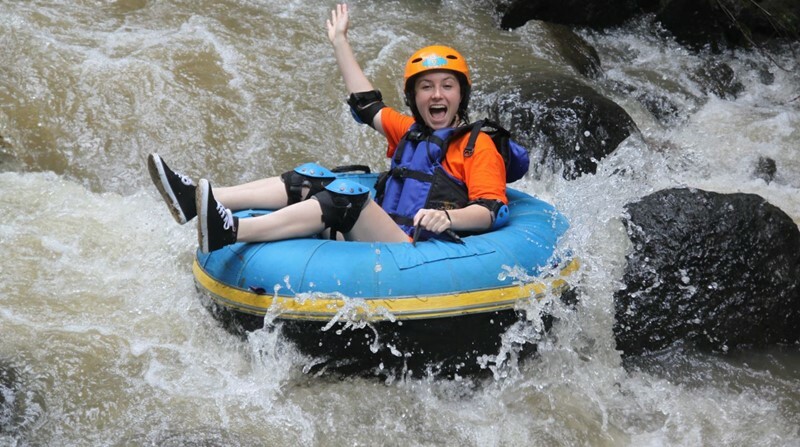 For child from 5 years, we may take them to 2 other river for enjoy and experience the tubing adventure, first option we have at Penet River and second option is Pakerisan River. Where is Penet River ? Well the river is located very close to Sangeh Monkey forest, name of the village is Tanah Wuuk. To reach the location, from Kuta take about 1,5 hours drive, then we will arrive at Tanah Wuuk Base camp, once arrival we will welcome with warm smile of the Balinese and get the morning tea or coffee with Balinese cake, the base camp is have a very nice bank river and valley view, we have some spot for selfie photo, wind breezing and you feel like out of stress. After welcome drink, our guide put on the helmet, elbow protector and start demo the safety tubing on the yard, please listen the instruction. After safety briefing, we will transfer to start point of Penet river tubing, and walk down pass the stair with nice path to get the river side. And get ready to splash and gliding on the tube for about 1,5 hours, along the trip we have visit the Cave, stop at waterfall and take shower at the fresh natural spring before walk up to our base camp for shower, change and enjoy the lunch. Tubing is round and all tuber will be sit on single tubing. After tubing trip, we may drive you or combine the trip with visiting Sangeh Monkey forest or If you love to see the Elephant, we may take you to Bali Elephant Camp, or combine the tubing with Atv ride or if you want experience the most popular activities in Bali, we have Bali Swing, swing as you like and see the river with nice panorama from your swing. Where is Pakerisan river tubing? Pakerisan is located Tampak Siring Village, before Tirta Empul Temple. Its take about 1,5 hours from Kuta to get there. The tubing duration about 1,5 hours and child from 5 years can joined here, we have Capsule tube, so child can be tandemed with Parent for feel secure. The start point we have short walk through the step and at finish point, we have walk quite long to get the transfer point to the base camp. What we can see after Tubing At Pakerisan River? Kintamani Volcano, Its take about 30 minutes drive uphill from Pakerisan river, the view are Volcano + Lake Batur with Breezing. Temen Spices Garden : Its take about 20 minutes from Pakerisan river, we can see the coffee, vanilla, clove plantations and try some local coffee. Tirta Empul Tampak Siring Temple: Its Take about 10 minutes drive from Pakerisan river to get there, we can see the holly water fountain with temple inside, If you want to do Purification Bathing, this is the right Temple to visit. Tegalalang: Its take about 20 minutes from Pakerisan river to get there, we can the see the beautiful rice terraces around here. Elephant Cave Temple: Its take about 20 minutes from Pakerisan river to get There, we can see the heritage Temple from 11th Century with Cave, Water Angel Fountain. Ubud Center : Its take about 30 minutes from Pakerisan river to Ubud center, we have Ubud Palace, Ubud Market and Ubud Monkey Forest. That is about tubing in Bali, we do hope you can decide now, which river you want to do ? I am ready to drive safely to get the location as your order.